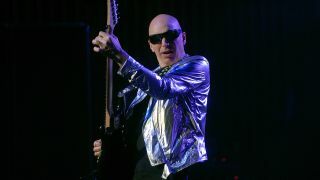 Joe Satriani has announced that his 16th solo album will be released early next year. Titled What Happens Next, it’ll arrive on January 12 via Sony/Legacy Recordings and will feature a total of 12 tracks. The guitar virtuoso is joined on the new record by his Chickenfoot bandmate and Red Hot Chili Peppers drummer Chad Smith along with Black Country Communion mainman and bassist Glenn Hughes. In addition, Satriani will head out on the road across North America to coincide with the release, with dates on the G3 tour planned throughout January and February 2018. The guitarist will be accompanied by Dream Theater’s John Petrucci and Def Leppard’s Phil Collen. Satriani says: “I could say that I’m surprised at the durability of G3 and how much it’s grown, but in a way I’m not. Satriani documentary Beyond The Supernova, which was helmed by his son ZZ, will premiere at the Mill Valley Film Festival this October. The film chronicles Joe, along with his band and crew, on their Shockwave Supernova tour throughout Europe and Asia. Find the What Happens Next cover art and tracklist below, along with the 2018 North American tour dates.